Think you know everything about Budweiser – the “king of beers”? 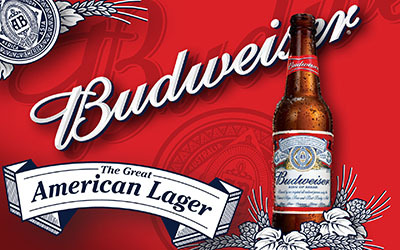 It should come as no surprise that Budweiser, that Great American Lager from multinational beverage and brewing company Anheuser-Busch, is one of the best-selling beers in America. Nowadays Budweiser is about as American as Mickey Mouse, McDonald’s Big Macs or Coca-Cola – but that hasn’t always been the case. Budweiser beer was created by one Adophus Busch. If that name doesn’t sound very American to you, you’re right – he was from Germany. When he moved to the United States in 1857 he brought with him the latest brewing techniques from Europe, which he used to open the Anheuser-Busch brewery with his father-in-law Eberhard Anheuser in 1864. At that time most Americans preferred dark ales to the lighter lagers that were so popular in Europe, but he didn’t let that stop him. On top of that, Budweiser became the first brewery in the US to pasteurise its beer, which hugely improved its shelf life and would later become standard practice for most major breweries. Meanwhile, the Anheuser-Busch Company was one of the few breweries during Prohibition that had the resources and business nous to change its beer-making process so that its beer was under the 0.5% alcohol limit threshold imposed by government, so that it could stay in operation. Less cool is the story – and controversy – behind the Budweiser name. The Budweiser lager that we all know today was inspired by a trip Adolphus Busch took to the Budweis region of the Czech Republic. Naturally, he named his beer after the region – Budweiser means “of Budweis”. The problem is that back then, European beers were generally named after the region or city the beer was brewed in. Beer from the Czech town of Pilsen, for example, were called Pilsners. Well, as it happens, there was already a beer from Budweis that is still made there to this day. That probably wasn’t a problem back then. In today’s age of globalisation, however, it’s been a bit of an issue for the Anheuser-Busch Company, which has done all it can to make sure that its beer owns the name Budweiser. As a result, the original Czech beer called Budweiser is sold as “Czechvar” in North America, while American Budweiser is sold as “Bud” in all European Union countries, except for Ireland and in the United Kingdom, where they both sell under the Budweiser name. It’s called “Budvar” in New Zealand. 4. Budweiser: marketing over quality? If we’re honest, the original Czech beer is the better of the two Budweiser beers. In fact, Anheuser-Busch is arguably better known for being a marketing juggernaut than the producer of a great beer – in spite of the “king of beers” moniker it’s given its own product. Whether you love it or hate it, Anheuser-Busch has always put a major focus on marketing Budweiser. For example, the company spent $246.2 million on just American Super Bowl commercials alone between 2002 and 2011. Either way, those marketing dollars helped make Budweiser the best selling beer in the US for much of the 19th and 20th centuries. Believe it or not, but Budweiser sometimes bills itself as a vegan beer. That’s because no animal products are used in the beer. However, some discerning beer drinkers might object to the inclusion of genetically engineered rice as one of the key ingredients in Budweiser.